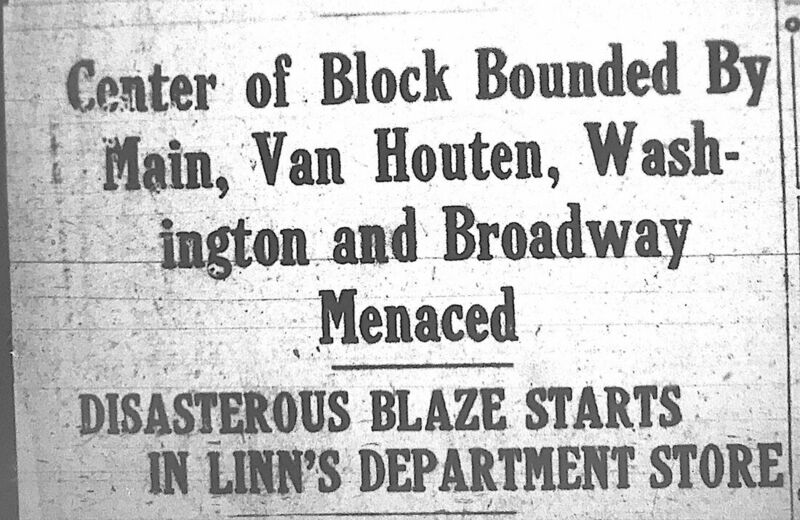 April 27, 1921: Station 451 (Main Street and Broadway) at 2:30AM for a 3 alarm fire at Linn Department Store and Klein's Suit and Cloak House at133-137 Main Street between Washington and Van Houten Streets. 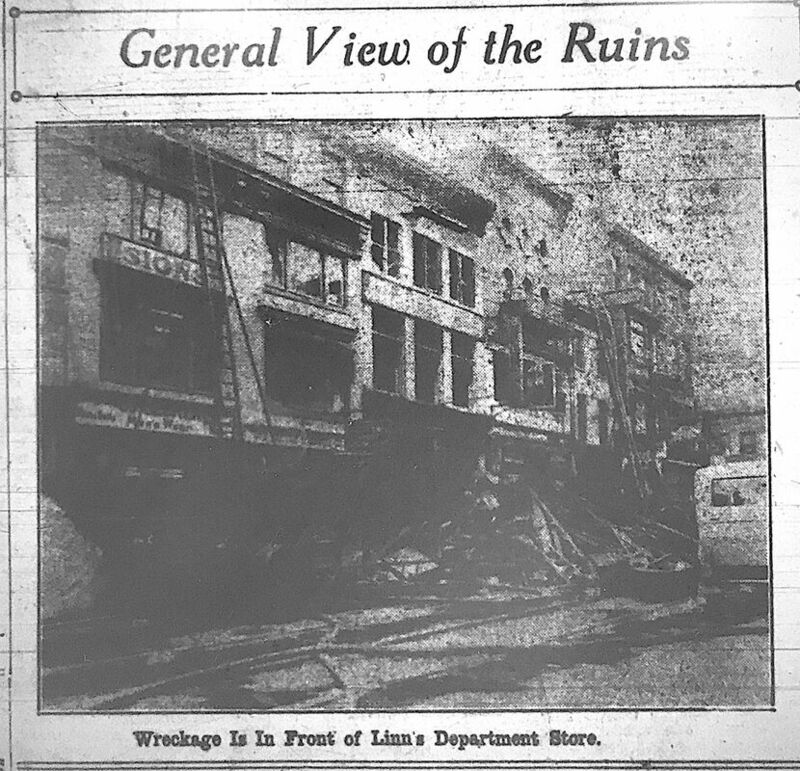 At he right of the of semi-legible news clips below are the "Translations"
Two firemen are dead, two are in serious condition and others and two policemen were treated at hospitals and a dozen other firemen and police officers sustained minor injuries in a three alarm fire that laid in ruins a three-story brick building at 135 Main Street owned by H.B. Stay and occupied by Bernard Liss at the Economy Dry Goods Store. The damage will exceed $100,000. 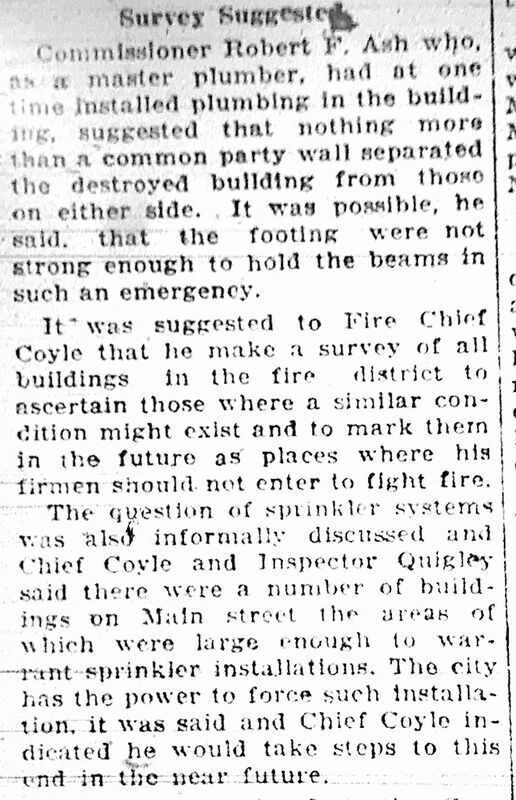 The city was steeped in grief with the -- of the early morning sun by the news of the tragic fire which glorified Fire Chief Thomas Coyle and his brave firemen. 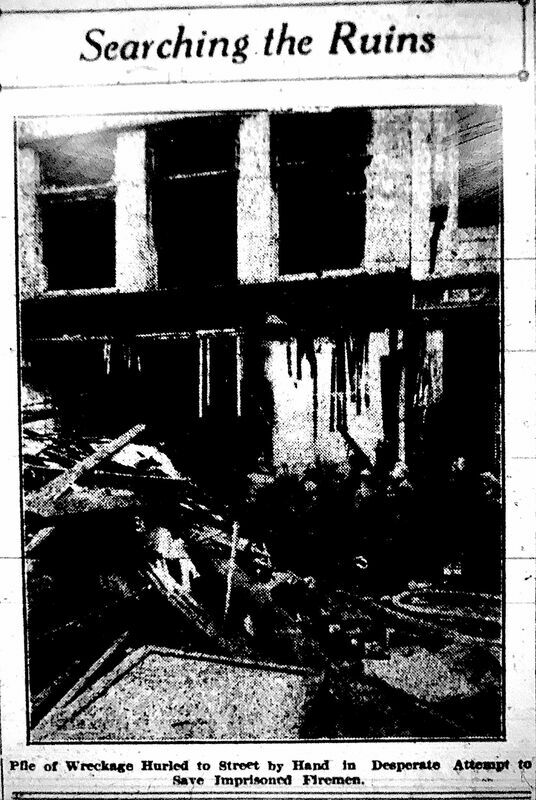 Two men Edward Tribe of 11 Nineteenth Avenue and Marinus Baker of 275 Paterson Avenue were killed when the second floor of the building caved in on them. Fireman John Heinzelman of Engine Co. 4 is confined at St. Joseph's Hospital in a critical condition suffering from injuries he sustained in the same manner as his two buddies. 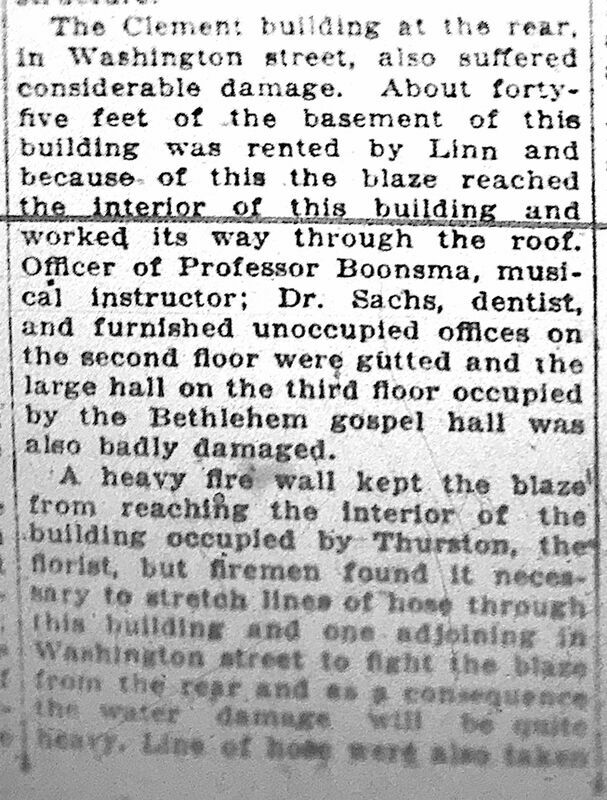 The conditions of Captain Eugene Murphy of Engine Company No. 4 was also critical. 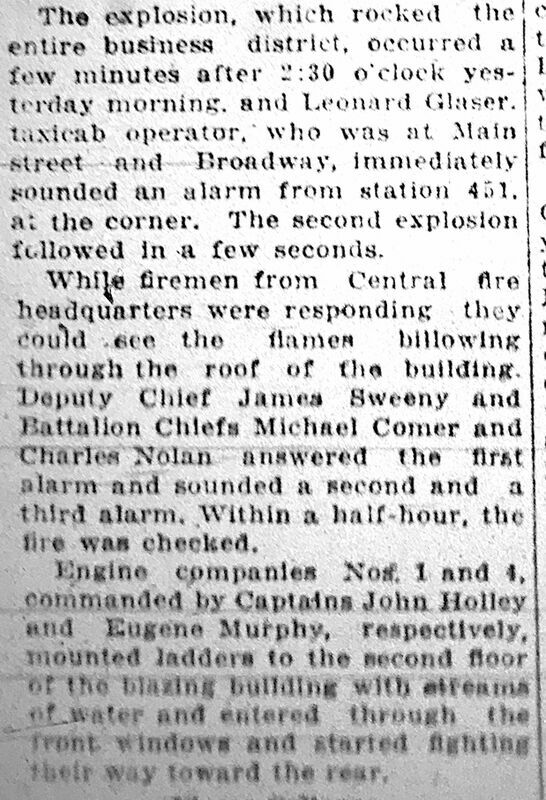 ​Others injured taken to St. Joseph's and the General Hospitals are Captain John Holly, Fireman Robert Summers, Chris Garrity, James Carr, John Toomey, John Roche, Joseph Shearer, Raymond Thompson, and William Smith. 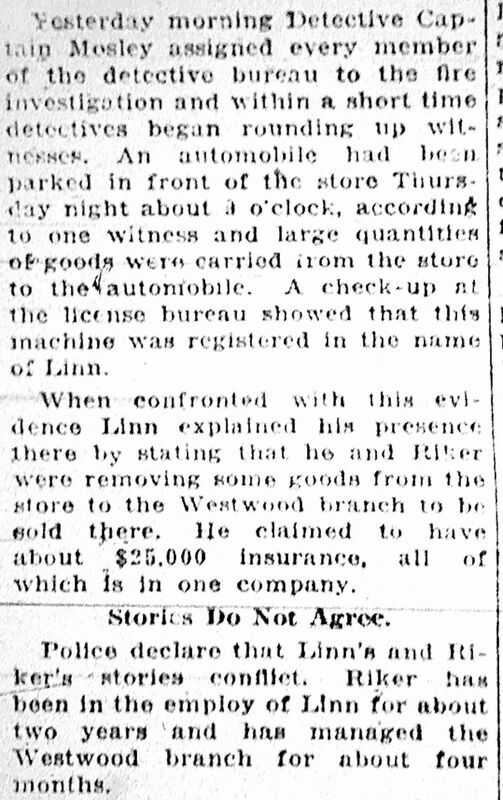 Police Sergeant William H. Elvin sustained a laceration of the right hand and Officer George Burton a rookie member of the force was overcome by the gas fumes. Two public service linemen are reported to have been injured. 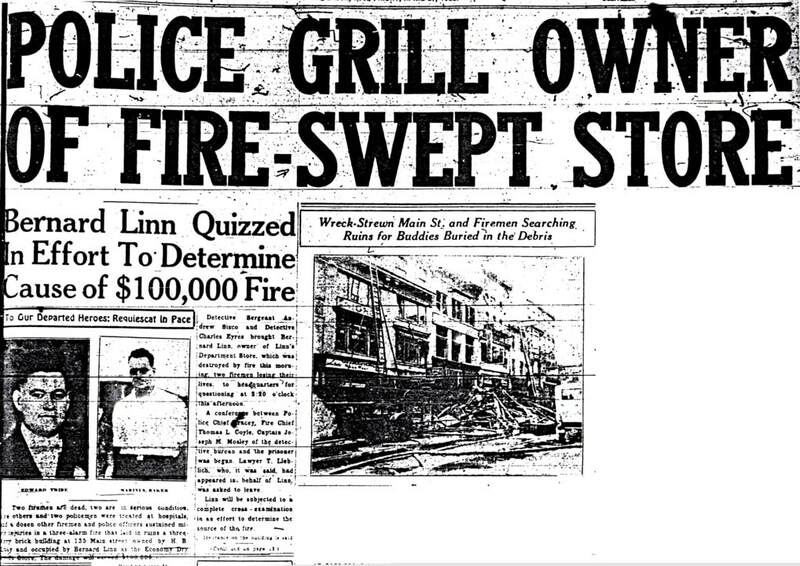 Patrolman Newman Stone whose beat covers the fire escaped although he did yeoman service. County physician William A. Norval announced that Marinus Baker died of a fractured back and suffocation. His back was broken by a beam which rested on his shoulders and back. Dr. Norval ascribed Tribe's death to suffocation although examination disclosed he had sustained a broken arm and there was a deep ridge across his forehead​, nose and face where a fallen beam had struck him. ​Fireman John Heinzelman (Engine 4) is believed by Dr Norval to be the most severely injured and will be X-rayed tomorrow. It is believed he has several fractured ribs. ​The county physician stated "he was of the opinion that none of the injured firefighter would die." Mayor Raymond J. Newman ordered the flag at City hall at half mast in honor of Marinus Baker and Edward Tribe who gave their lives in the early morning blaze which burned three stores on Main Street. ​In addition to that the executive announced that because of the unfortunate incident he has postponed the annual inspection of the Police and Fire Departments scheduled to be held for a week. 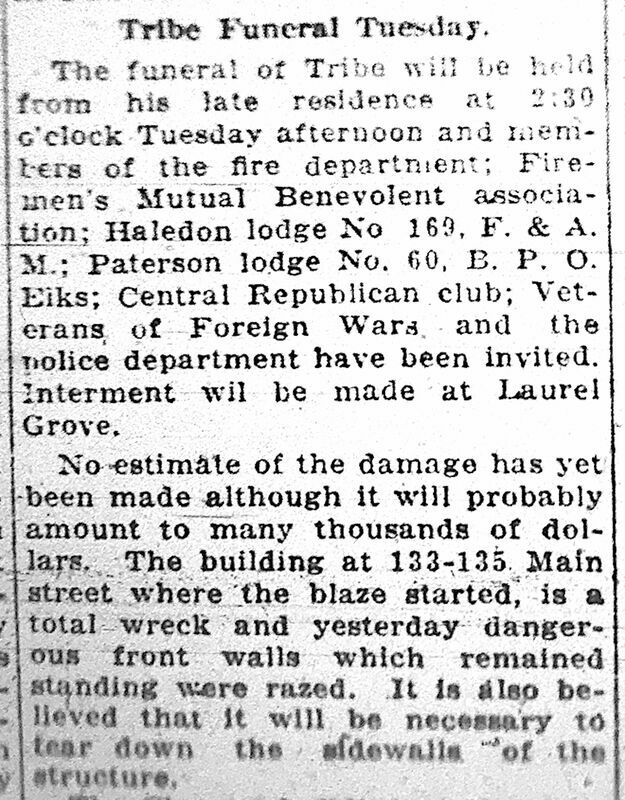 He thanked the members of the fire department for the heroic manner in which they worked at the blaze. 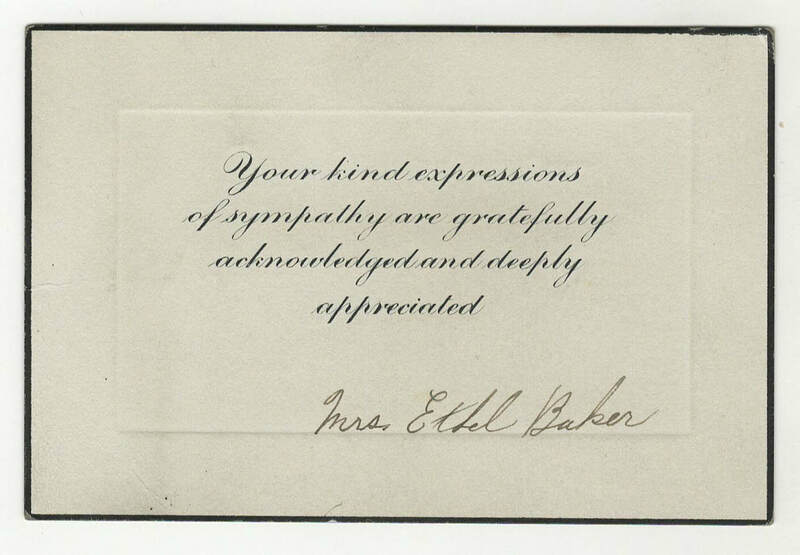 After remaining at the scene for several hours he did a tour of the hospitals to see the injured men.